Meet McWane | McWane, Inc.
Tyler Pipe & Coupling is pleased to announce the promotion of Sterling Bowman to Vice President of Sales for Tyler Pipe & Coupling. Sterling will continue his responsibilities managing the Tyler Pipe sales team and manufacturer’s representatives. Sterling is a Texas native who enjoys playing golf and hunting as well as spending quality time with his wife Erica and their four sons; Cleet, Colt, Case and Crew. Mike Emhoff is retiring from Tyler Couplings in Marshfield, Missouri, after 43 years of dedicated service. 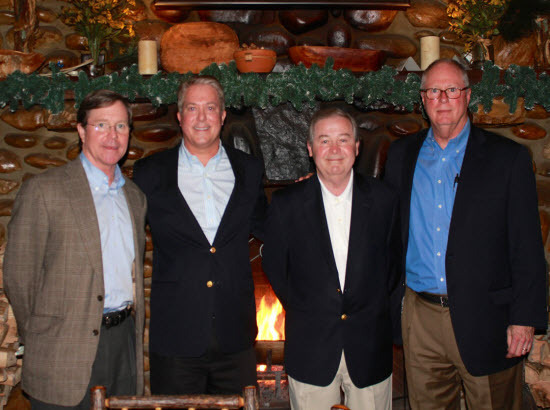 Mike celebrated his retirement with fellow team members, family, and friends at a reception held on December 31. Everyone enjoyed a slideshow presentation showing how the facility and people had changed over the years. Mike began his career in 1972 as a tool maker in the Tool & Die Department when the facility was known as Northern Metal Products. Through the years, the company changed to Alloy Unlimited, Plessey Aero Precision, and Tyler Pipe and finally to Tyler Couplings. Mike transferred to the Maintenance Department in April 1979 and was promoted to a management position in 1986. Mike’s latest position was the Supervisor of Maintenance, Tool & Die, and Screws. 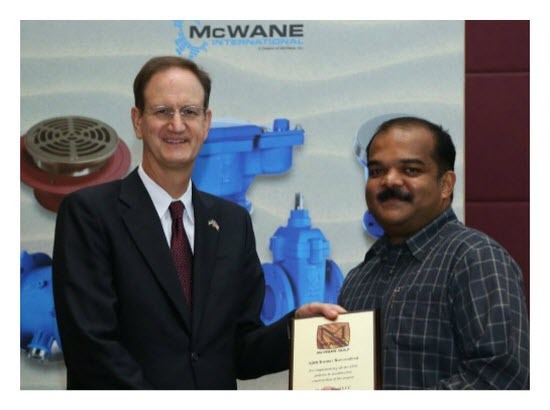 At the recent grand opening ceremony for the new McWane Gulf manufacturing facility in Abu Dhabi, Mike Keel was proud to recognize Ajith Raveendran for his performance in implementing all of the McWane EHS policies during the construction of the facility. Ajith is the Senior Manager of EHS & Quality at McWane Gulf. He worked diligently to assure that they were accident-free during construction. 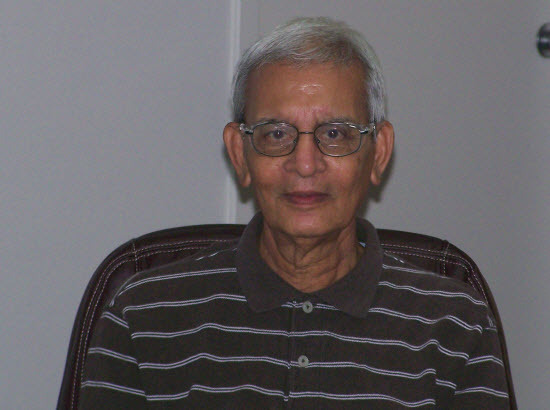 Benu Chakraborty worked at M&H for 27 years, mainly in the Foundry Sand Lab. Benu retired on August 1st and was sent off with a retirement party where his fellow team members wished him a fond farewell. Benu lives in Jacksonville, Alabama, with his wife, Shibani, and has plans to travel to his home country of India. Courtesy of Darlene Berta (wife of team member Chris Berta), the incredible fire hydrant cake was a hit! Best wishes, Benu, for a long and happy retirement! 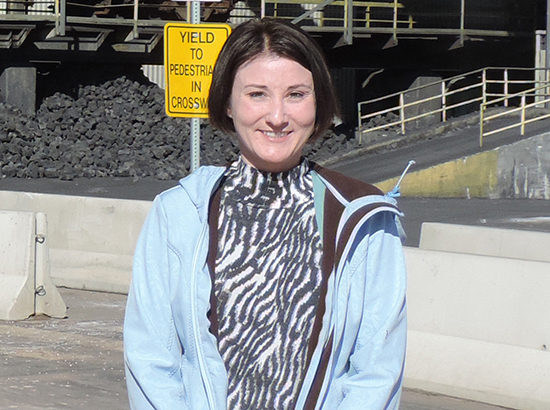 We are pleased to announce that Krystal Hansen has joined the McWane Ductile-Utah team as the new HR Manager. Krystal has a Bachelor’s degree in Psychology and Political Science from the University of Utah. She has extensive HR experience, most recently as a Human Resources Business Partner. Prior to that, she was the HR Manager for Unicity International. Krystal owns two horses named Joe Joe & Annabelle and she enjoys riding, being outdoors and camping. Please join us in welcoming Krystal to the team! 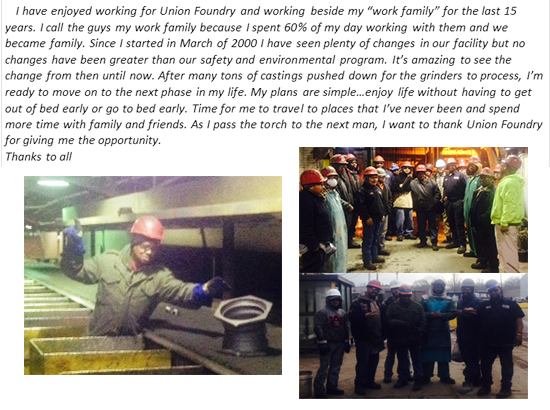 Tyler Union team member Leroy Sistrunk retired on March 1st, 2015. Leroy began his career at Tyler Union on March 22nd, 2000, in the Disa Millroom. Leroy’s friends and co-workers knew him as a serious “down-to-business” man, rarely joking until his favorite day of the week rolled around…Wednesday. According to Dale, Leroy had one request on his last day and that was to know how it felt to instruct the crew. Dale obliged and under his close supervision, Leroy got his wish. He even let Leroy wear his hard hat for a while! Leroy, we wish you a happy and relaxing retirement – and we will certainly think of you and your “payday dance” on Wednesdays! The Tyler Pipe & Coupling Team in Marshfield, Missouri, bid a fond farewell to Anna Burchett who retired on January 30, 2015. Anna started out in the Coupling Department in 2007 when she joined the company, but was soon promoted from Production Machine Operator B to Pre-Assembly Operator. 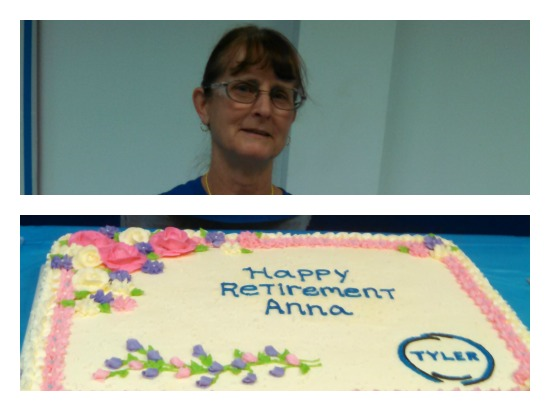 Anna was honored with a retirement reception complete with cake and punch. She was also given a strand pearl necklace and earring ensemble and bouquet of flowers to thank her for her years of dedicated service. Congratulations, Anna! Enjoy your retirement! Danny Clymer is retiring from Manchester Tank & Equipment (MTE) after 15 years of service. Danny has served the company in a number of roles including leadership of human resources, operations, engineering, and purchasing / supply chain. He has also been active in managing MTE’s Australian operations for much of the last 10 years. 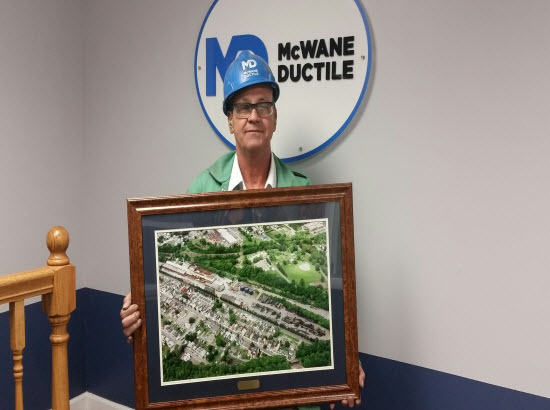 Manchester Tank held an event in his honor last Thursday night, which was attended by McWane President Ruffner Page and many of Danny’s current and past colleagues from the MTE Franklin office and U.S. plants. Danny had the entire group laughing for close to an hour as he “bequeathed” many of the items from his office that he felt should stay with Manchester team members going forward. We will miss you, Danny, and wish you all the best in your retirement! 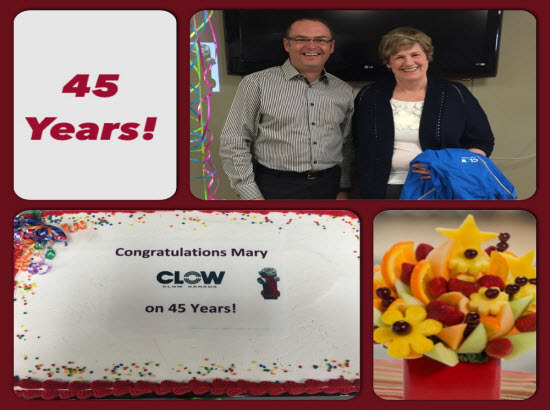 We have had several of our team member retiree from various divisions over the past month and would like to highlight them for their service! Pacific States Team members bid a fond farewell to Glen Cox at his retirement party at the beginning of the month. Glen joined the Pac States team over 45 years ago in 1968. His most recent job was in the Melding Department as the Iron Yard Crane Operator, a job he had held since 2008. 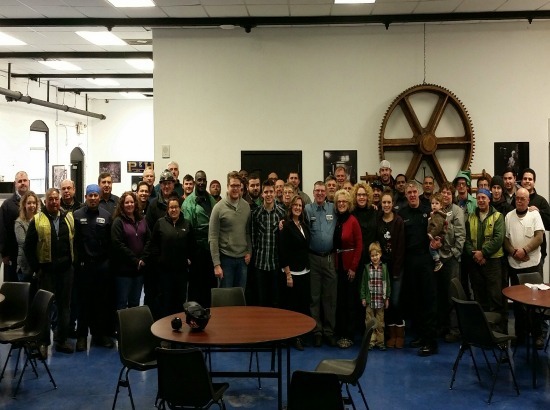 On January 9, team members at Tyler Pipe & Coupling, retirees, family, and friends came together to bid a fond farewell to Jack Terrill who was retiring after 43 years of service. 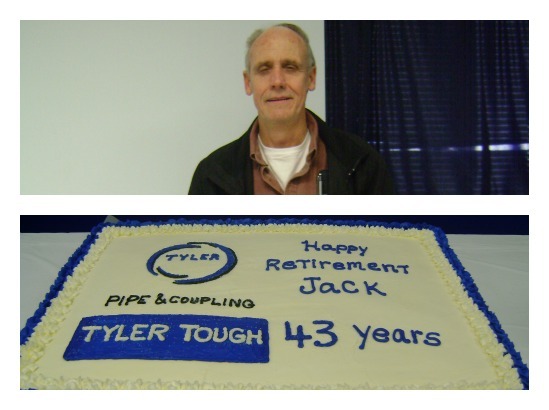 Jack joined the Tyler team on December 20, 1971, and worked as a Warehouse Worker “B” in the Coupling Department at the time of his retirement. Everyone enjoyed taking a walk down memory lane with Jack. To show Jack their appreciation, Plant Manager Bill Hoffman gave Jack a watch and a Tyler Pipe & Coupling hat. Atlantic States will be bidding a fond farewell to veteran team member Nelson Greenleaf in February. Nelson is retiring after almost 48 years of service! During his tenure with the company, Nelson has seen a lot of changes. In fact, the company has changed names 3 times since his arrival! Since he started in 1968, Nelson has worked throughout the entire plant and currently holds the position of Scale House Technician. Nelson is known for saying thanks for coming in today, and the entire team will miss hearing that. An amazing thing about Nelson is that he hasn’t been absent or late since 1995 which gives him perfect attendance for the past 20 years. Wow! He is an exceptional and dedicated employee who will truly be missed. Nelson has helped build Atlantic States to what it is today and we are thankful for all his years of service. Nelson is looking forward to retirement so he can spend time with his family at their vacation home at the beach in Delaware. The team presented Nelson with an aerial view picture of Atlantic States signed by the entire team on the back along with $1,500 in gift cards. The Amerex team bids a fond farewell to HR Manager Sam Wester who retired last week after 31 years of service. You would be hard-pressed to find somone at Amerex whomSam didn’t help or hire over the years. 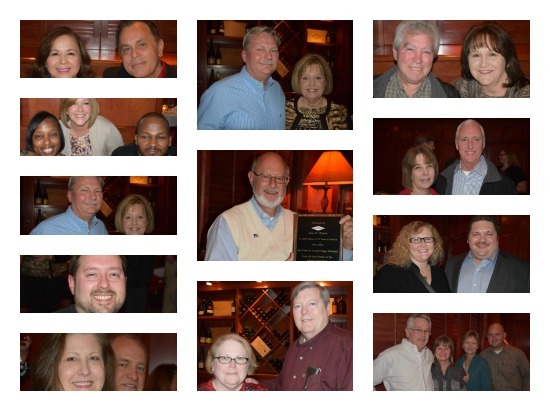 The team held a retirement party for Sam on Friday, January 23, at Flemings. Everyone enjoyed the night and had lots of laughs taking a walk down memory lane with Sam. 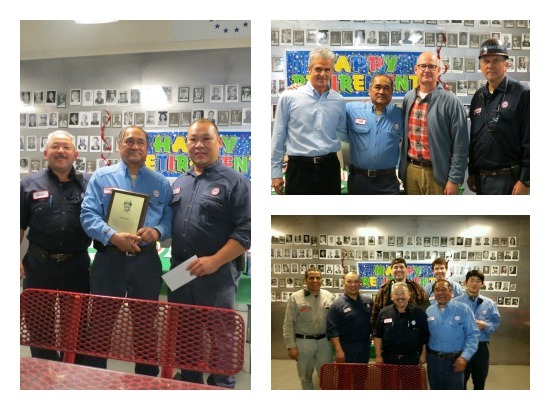 Team AB&I recently bid a fond farewell to Virgel Esteban after 30 years of service as an Electrician. His send off included a luncheon with a wide variety of Chinese food, including roasted duck and chow mein. In gratitude for his service to AB&I, Virgel was presented with a trip for two to Chicago, Illinois. He also received a gift from the Sales Team and a retirement plaque. Thank you, Virgel. for being a dedicated member of the AB&I Team for the last 30 years. We will surely miss you and hope you enjoy your retirement as well as your time in the windy city. 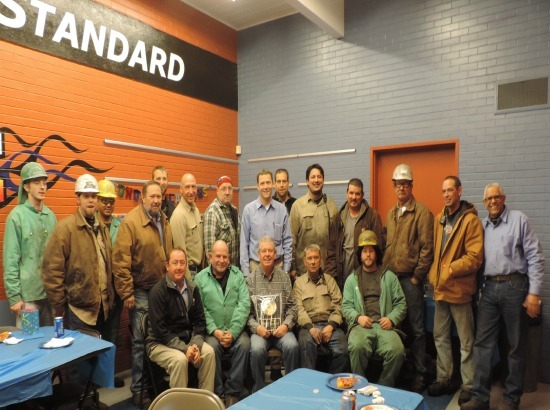 We are honored to have such committed team members to dedicate life-long service to the McWane Family of Companies. We appreciate all that each of you have done and wish you all a very happy retirement. Thank you for you service!